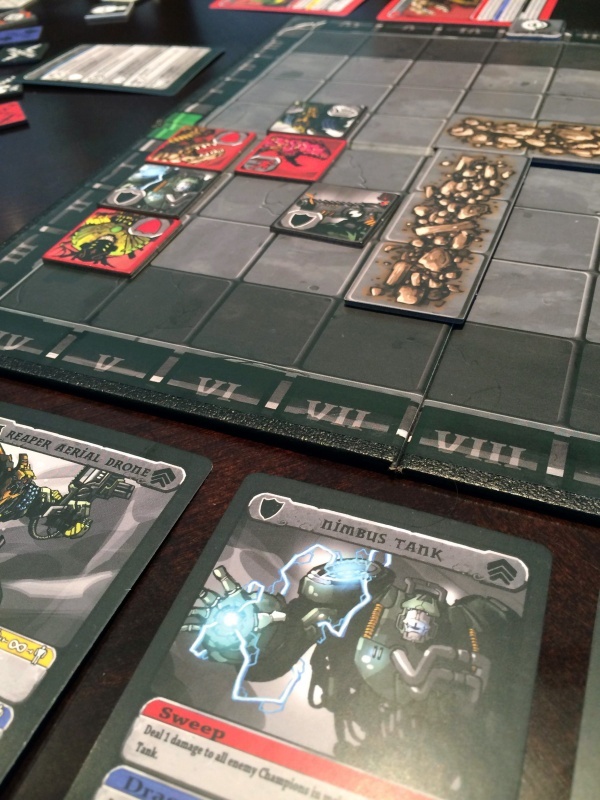 We review the new card game Titans Tactics. In this new game, 2 players will be battling each other by sending heroes, villains and monsters into the area to duel to the death. Do you enjoy the ebb and flow of tactical turn-based combat? Is the thought of sending heroes, villains, and monsters into battle appealing? Do you have a limited time for gaming, so you appreciate games that do not last for hours on end? In Titans Tactics by Imbalanced Games, you command a team of champions to fight against your opponent. Can this small-box game give you a solid skirmish experience and still give you enough time to eat your lunch before returning to work? Keep reading to find out! 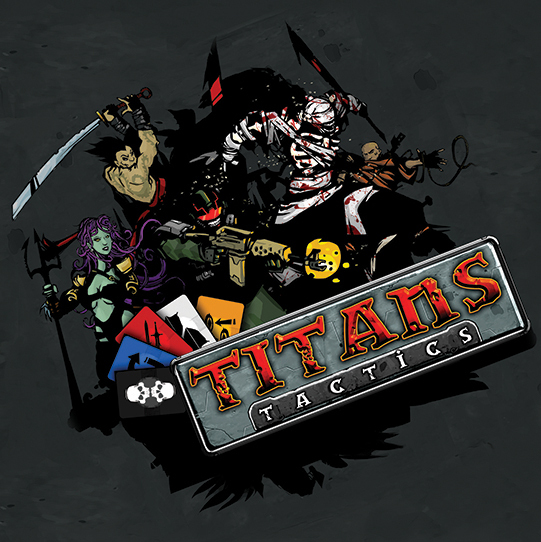 Titans Tactics is a tactical combat game for 2 players that plays in 30 minutes or less. In Titans Tactics, each player leads a faction of champions into battle against the champions of their opponent. Each faction (which encompass traditional genres such as zombies, pirates, and dragons) is comprised of six champions, and each player chooses three of the six to lead into battle. Each champion has different ongoing and activated powers that can be used to do deal and reduce damage, affect enemy champion statuses, or provide battlefield control. During each round, damage differential (damage dealt vs. damage taken) for both players is tracked, with the higher differential being awarded a Momentum Point. The game is played until one player either achieves a damage differential of +10 or is awarded 3 Momentum points, at which time they are declared the winner. The game plays to a maximum of five rounds due to the nature of the victory conditions. The quality of the components shows clear forethought by the game designers. The cardboard tiles representing the champions are double-sided and quite durable, as are the game board and the status tokens. 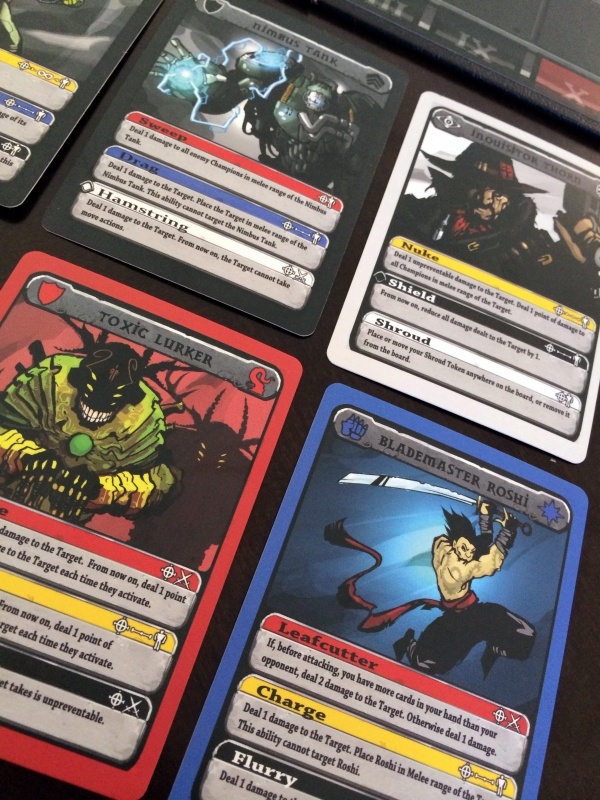 The champion cards and skill cards are equally as high in quality, with a thicker and more sturdy card stock than found in mainstream deckbuilding games, which gives the cards a more substantial feel. The artwork on the cards is well done, giving life to the champions that you are sending into battle. 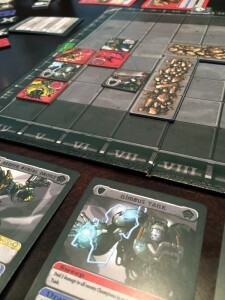 The card artwork matches up with the artwork on the champion tiles, but the lack of the champion name on the tiles added some time to the game in the first few plays, since the characters of the world of Titans Tactics were unfamiliar initially. The iconography and script on the character cards are very intuitive, with icons used for ongoing powers (both on the card and tile) and power effect range. The one point where the artwork falls short is the game board. Ostensibly representing a battle arena, the board is merely functional as a grid, with no added embellishment to add to the theme of the game. Many genres are represented, from demons to samurai to pirates. Titans Tactics begins with each player selecting their faction, then secretly selecting three champions to field from that faction. The champions each have an ongoing power (shown by an icon on their card & tile) that is active at all times during battle. These powers include additional damage, additional movement, damage reduction, targeting bonuses, or freedom of movement. In addition, the champions have three powers that can be activated and used. These powers, each coded with various colors, include dealing damage, boosting or reducing damage, changing the range of powers, forcing other characters to shift position, or imbuing statuses on friendly or enemy champions. Each faction has its own particular flavor of powers and various synergies between the champions. Player order is then determined and locked in for the duration of the game. Walls, which serve as obstacles to movement (but not line of sight for attacks), are then placed by each player. Setup of the board is finished by placing the champions on the board, one player at a time. At this point, players choose their starting hand of five skill cards. Skill cards, each with a different color, correspond to the colors of the powers of the champions. 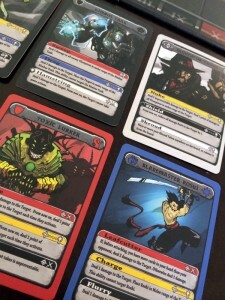 Selection of the skill cards is always done by player choice, never by random draw, so it is important to draw a set of cards that provides for activation of all character powers. Move: A champion can move up to four spaces and cannot move through walls or other champions, unless they have the ongoing power that lets them. A champion can also not end their movement in another champion’s space. In addition, if a champion is also moving out of a square adjacent to an enemy, there is the possibility of taking damage. Use a power: Discard a skill card matching the color of the power the champion is using. Most powers require a single discard, but some powers boost in strength depending on the number of skill cards that are discarded. Powers can be used either on themselves or on enemies at various ranges (adjacent, within three squares, anywhere on the board). Keeping track of board positioning is important when determining your tactics, since once your champion engaged with an enemy (meaning you are adjacent to them),you can only use powers that either target your champion or the enemy (or enemies) that are engaged. Yield: Pass and do nothing. Damage is dealt by champions to champions, but there is no possibility of KO or elimination. Instead, damage is tracked through a balance token, which moves back and forth on a scoring track throughout the game. On each turn, the balance token is moved one space towards a player’s goal (representing 10 points of damage) for each point of damage they successfully deal to their opponent’s champions. After the two actions are performed, a player can choose to either push their champion, allowing an additional action that turn, or plan for their next turn, which allows the player to draw three new skill cards of their choice. The End Phase begins when all the champions have been activated for the round, at which point a Momentum point is awarded to the player who dealt the most damage that round (and consequently, the player who has the balance token closest to their goal). Ongoing statuses on characters caused by powers (granting them boons or banes, depending) are optionally sustained by discarding the appropriate color skill card, and the next round begins again. The game continues for five rounds, at which point one player will have earned three momentum points, or possibly less rounds, if the balance token reaches a player’s goal space. Titans Tactics gives you a wide range of champions to choose from, each with their own unique powers. Titans Tactics certainly delivers on its promise of pure tactical game play in a short time span. In the games that were played, only the first few went 40 minutes, with the rest hitting in the advertised sweet spot of a half hour due to our acclimation with the game mechanics, the various powers of the champions, and the steps needed to achieve victory. The game provides players with the opportunity to explore and implement various strategies in champion selection each game. With three of six champions chosen per game, there are twenty possible combinations of champions per faction to play with. Choosing champions is important in terms of synergy of their powers, as well as working to make sure there are common skill colors among the three champions. The most success was found when champions were chosen that all shared at least one skill color, if not two skill colors, which provided more flexibility in terms of tactical choices throughout the game. Unfortunately, there are a few possibilities where the champions selected by each player will lead to a weaker playing experience. In one game, all of one side’s characters had an ongoing ability where they reduced damage from each attack by one point, while the other side’s characters all had attacks that did only one damage. Needless to say, that was a very short game, but a valuable learning experience for making sure to vary the damage outputs of the champions selected. Character placement becomes paramount in such a small arena. A major positive aspect to Titans Tactics as a skirmish game is the complete removal of randomness as part of the combat model. 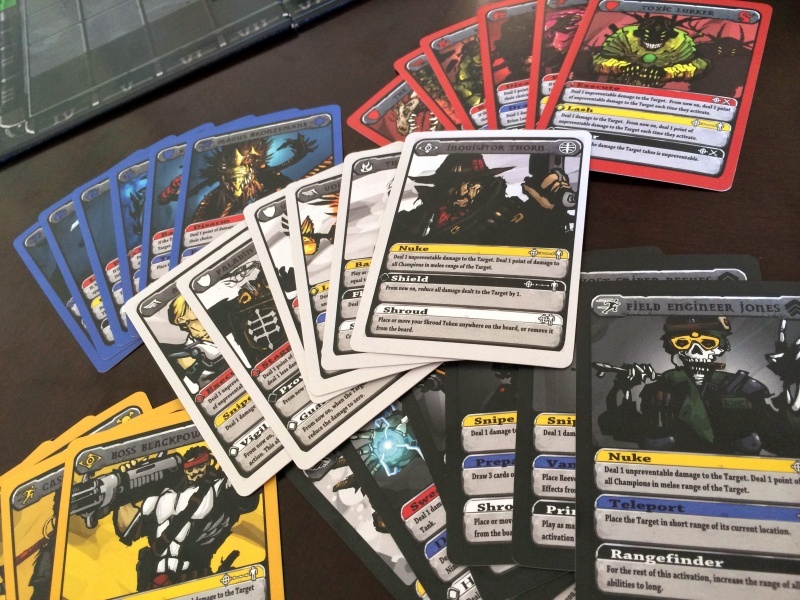 With the skill cards being selected by players as opposed to random draw, and damage being dealt without a dice randomizer (like HeroClix) or card draw (like Wings of War), the game forces players to plan out their tactics carefully in order to maximize the amount of damage their champions are dealing each turn, while minimizing the damage they will take in subsequent turns and rounds. The balance meter and Momentum tokens are a novel and easy way of keeping track of damage, and the win conditions are designed well to keep each game brief. In the games we played, we had both Momentum victories and Balance goal victories occur, with the Balance token hitting the player goal in the round they would win via Momentum anyways. In skirmish games, it is easy to get outnumbered and overwhelmed easily, so implementing a system that keeps all the champions in play without elimination is a smart move. That said, once a player has fallen behind on the balance meter, it was found to be very difficult to bounce back and stage a rally to victory. A house rule or variant could be developed to reset the Balance meter back to the middle at the beginning of each round, but it would clearly need further testing and exploration. Titans Tactics does a solid job of giving players a tactical experience in a short time span. While the theme is not as immersive as other combat games, it does well enough to give the powers that your champions wield some basis to their presence. Variable champion powers provide for a different experience each time the game is played. 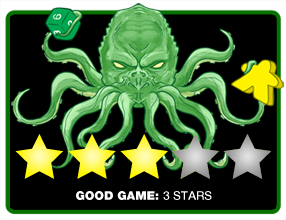 Game play is tight and streamlined, with careful planning and forethought rewarded in victory. The design steps taken to eliminate randomness from the mechanics add to the fun of pure tactical game play. Titans Tactics will appeal to any fan of skirmish-type games who want to get their fix in a shorter time span. Thanks to its short game time, this can even serve as a filler game while waiting for the rest of your gaming group to get to the table before getting down and dirty with longer, more involved games. While Titans Tactics is not the first game I would turn to for a quick two-player game, there are many out there who will find this game a worthwhile addition to their collection. Final Score: 3 Stars – Quick, light and to the point. If you like tactical battles, pick this one up.